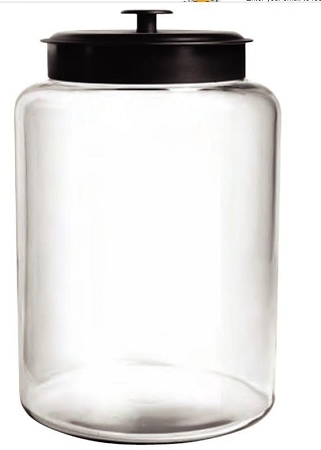 The 2 Gallon Montana Glass Jar with Black Lid stands out when amongst other storage containers. Not only is it large and in charge, it is stylish and catches the eye of all who come near. 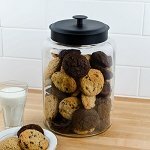 When you show your products in a clear glass jar, it adds a sense of charm that cannot be beaten. 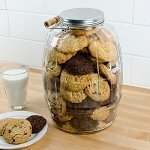 Fill this round canister with products like candy, nuts, snacks, dog treats and other like-minded materials for a display that customers will remember. The 2 gallon capacity of this storage bin is the same amount as 32 cups. This clear glass makes it easy for patrons to peer inside for their favorite edibles. 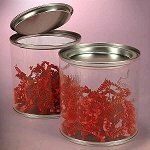 Use this eye-catching container at home or the office and create a wonderful candy buffet at your next special occasion. Ordering is easy, just click and add to your shopping cart today! Overall Dimensions: 11 1/4" H x 8 3/4" Dia.